Map showing West New Guinea region. Dutch expeditions in Netherlands New Guinea in 1916. 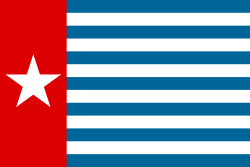 The Morning Star, flag of West Papua. Map of former Irian Jaya Province showing major Papuan cities. The Regencies in 2001 were: Biak Numfor; Fakfak (Fak-Fak); Jayapura; Jayawijaya; Manokwari; Merauke; Mimika; Paniai; Sorong; Timka; Wamena; and Yapen Waropen. "Human Abuse in West Papua - Application of Law to Genocide"
Declassified US documents on "Act of free choice"
Tauli yang miyalilan ining bulung anyang 14:33, 21 Marsu 2017.